Bang Rak Beach (Big Buddha Beach), is a very popular beach on Samui and is named after the 12 meter tall statue of Buddha. This beach is a great place to see suset on the beach. 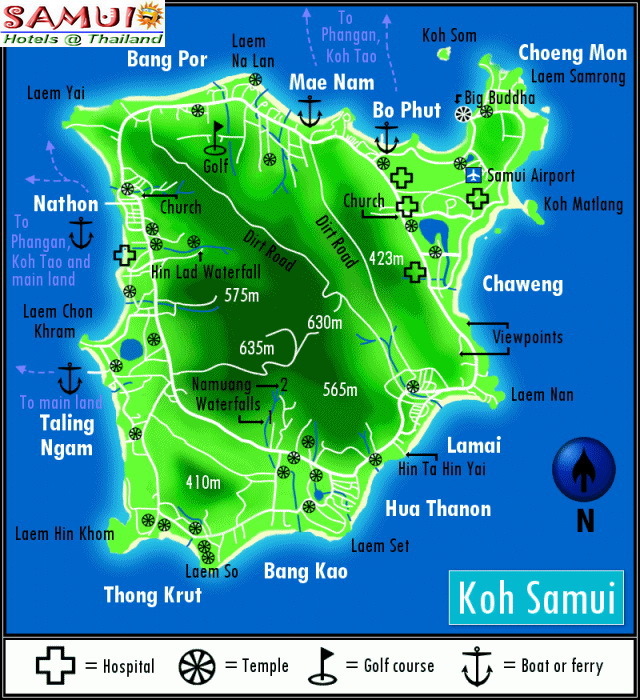 Big Buddha beach is also known on Koh Samui as Bangrak beach. Big Buddha beach offers a wide range of great attractions and activities for visitors. For those of you that prefer an active holiday you will find a number of great water sport activities including diving, snorkelling and some motorized watersport activities. The water at Big Buddha beach is nice and calm and is excellent for those tourists that enjoy swimming in the beautiful sea. The retreat offers just 2 large traditional wooden Thai style rooms, both are nestled in a tropical garden paradise right on the beach. This Boutique resort consists of 40 stylish architectural modern type rooms with real teak wood furniture. only 20 rooms, we are able to concentrate on the personal touches and the little details which make your stay more memorable and special. The surrounding village and a must visit for its restaurants, low key but fun nightlife and general fun atmosphere. All 33 Rooms are elegant and comfortable designed. 15 rooms on two floors. Our two room types are the Sea Breeze and Beachfront suites. All rooms have breathtaking views of the ocean, are beautifully decorated. 12 spacious rooms, well equipped with either a king-size bed or two single beds offer all needed comfort like air condition, cable TV, a minibar, WiFi. 80 Fan and A/C rooms. All rooms have TV ,balcony / veranda and guests have full use of the resort’s facilities. Our bungalows are set in tropical garden with a private balcony. Secret Garden is a sure bet if you are seeking the perfect getaway from the hectic and stressful lives from which we all strive to escape. 25-guest rooms in 5 categories : Deluxe Rooms, Garden Villas, Ocean Villas, Jacuzzi Suite and Waterfall Seaview Suite. You can chose form Seaview Suite Room, Deluxe Rooms and for the lower budget traveler even vey affordable clean and comfy standard room.